This round box, probably used to store food, is decorated with rosemaling. Made in Norway in the 1830s or 1840s, it belonged to Guri Gaarden Thompson, who brought it to America when she emigrated in 1848. Both the box and its lid were turned from a single log. It was acquired from Guri Thompson’s granddaughter, Ella Mavis, who donated it to the Mount Horeb Historical Society. While there are ambiguities surrounding certain aspects of the box and its history, it nevertheless serves as an example of the rosemaling artistic tradition. Rosemaling is a decorative art, unique to Norway, developed in the early eighteenth century as an off-shoot to the country’s carving tradition. When acanthus carving was introduced to Norway in the late seventeenth century, the style was popular with aristocrats and wealthy merchants. As the acanthus-leaf motif spread throughout Norway adorning churches, parishioners desired objects decorated in a similar fashion. However, the skilled work required to carve the intricate acanthus designs was too costly for most Norwegians. Rosemaling developed as a translation in paint of the carved designs. This allowed the decorative style to be accessible to the larger society. Rosemaling is Norwegian for “floral painting”. The dramatically colored floral images are set-off against a solid painted background. Rosemaling is characterized by its curved and scroll-like representation of flowers and leaves. It took these traits from the Baroque and Rococo styles as expressed in acanthus carving. Both of these styles emphasized curving “S” and “C” shaped lines. The Baroque style maintained symmetry in its designs, whereas the Rococo style frequently used asymmetry to create dramatic forms and outlines. In the same way that both symmetry and asymmetry are present in acanthus carvings, local rosemaling traditions vary in the degree to which they rely on symmetry. In the valleys and fjords of Norway, separated by rugged mountains, rosemaling developed into several distinct regional styles. These styles, while all hewing to solid-colored backgrounds with floral painted designs, nevertheless relied on different color schemes and depictions of flowers. For example, the Telemark style from southern Norway features highly asymmetrical leaves and flowers emanating from a root to fill the surface on which it is painted. In contrast, rosemaling in Os on the western coast tends to be more geometric, displaying symmetry in two or four directions with more restrained curves. Guri Thompson, like most Norwegian immigrants to the Blue Mounds region, came from the Valdres region and the rosemaling on this box is characteristic of that region’s style. Rosemaling in Valdres is often painted on a blue or teal background. The flowers and leaves tend to be grouped together like bouquets, which can be either symmetrical or asymmetrical. 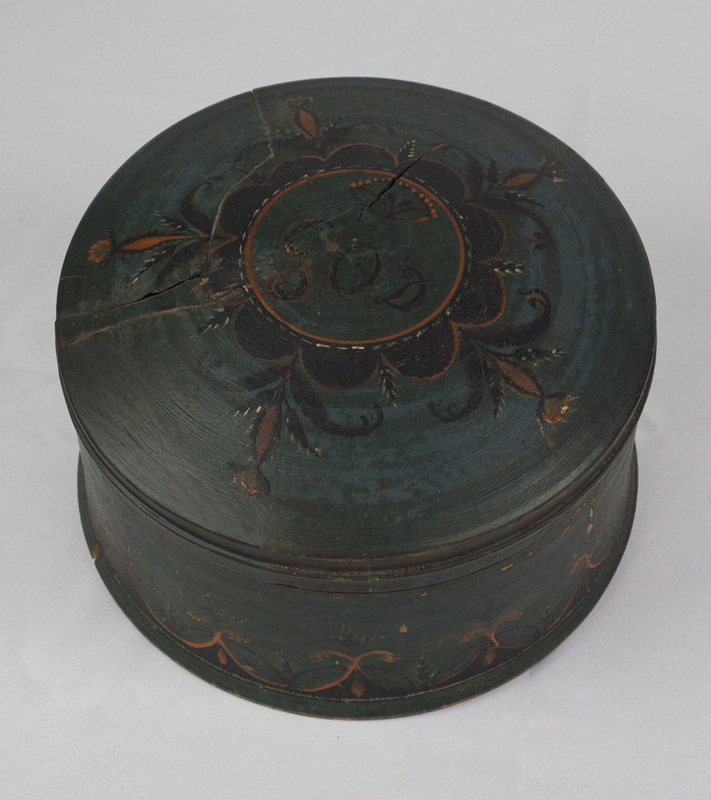 Such bouquets appear on the lid of this teal box where identical flowers spout in five directions from a circular blossom depicted in the center. Another element common to the Valdres style, a string of flowers connected as if they were tied in a garland, appear around the sides of the box. One aspect of the history of this box remains unclear. The initials “G.O.D.” appear in the center of the lid. Museum records relay that this stands for “Guri Olsdottir” (Ole’s daughter). However, the records also indicate that Guri Thompson’s maiden name was Guri Thorson Gaarden. The reason for this discrepancy in the initials on the box is unknown. According to Norwegian naming conventions Guri should have had a name ending in “dottir”. It is possible that “Olsdottir” was part of her name, but without genealogical information that cannot be resolved. Illinois Norsk Rosemalers’ Association. “What is Norwegian rosemaling?” rosemaling.org. http://www.rosemaling.org/history.htm (accessed May 18, 2017).